The SLYSTEEL Skeletek Dagger is designed by Oliver Hannan with the primary purpose to be a self-defense boot knife. The highly versatile and perfectly symmetrical blade is stiff and precision-sharp. 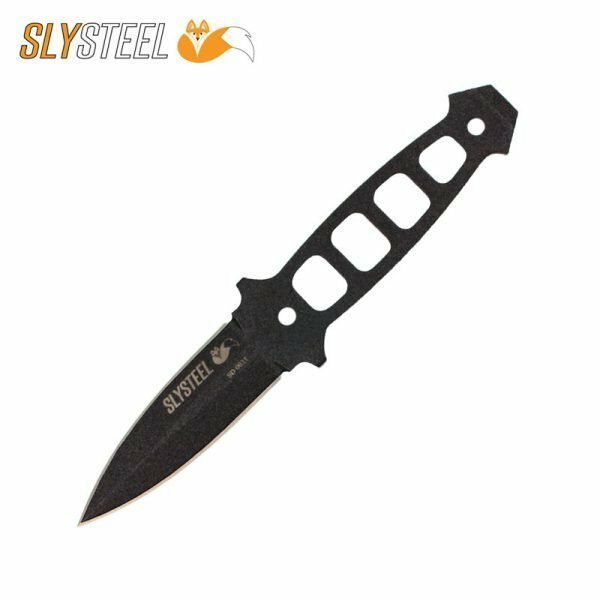 While the primary purpose of the SLYSTEEL Skeletek Dagger is self-defense, its versatile design allows it to be used in a survival scenario and may even be used as a spear in a pinch. Additionally, the sheath design is customizable and permits multiple rigging options not found in other sheaths. The construction is sturdy yet nimble for a lifetime of use. The blade is symmetrical from the pommel to the tip. 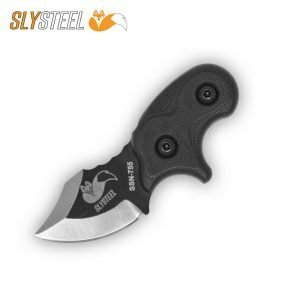 It is compact and yet has real heft when equipped with the standard grip scales. The compact blade is easily controlled for precise cuts in close quarters, such as cutting a seat belt to free a victim in an automobile accident. The dual edge blade easily slices through the most robust nylon webbing and seat belt materials. The symmetry of the knife means that either edge can be the primary or secondary edge. The knife symmetry is carried over into the sheath design as well. The sheath allows the knife to fit with either edge of the blade facing up. The sheath has an intentionally tight fit and an unforgettable resounding retention snap. The sheath can also be set up in multiple configurations: right-handed, left-handed, vertical or scout draw. 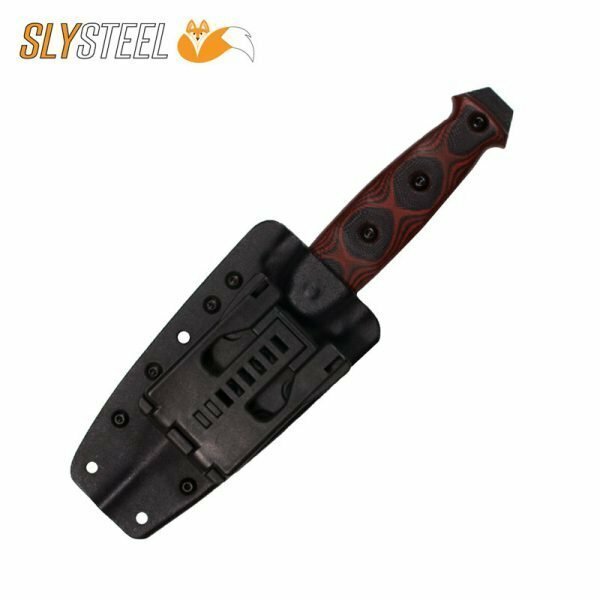 The sheath is compatible with Blade-Tech Tek Lok adjustable belt clip or MOLLE Lok attachment devices. It can also be attached directly to any sheath or holster that employs ¾-inch standard rivet spacing. This design offers the user a multitude of rigging options not commonly found on typical daggers or boot knives. The design of the sheath maintains its positive retention on the knife whether equipped with the standard grip scales, wrapped in paracord, or naked skeleton handle. With the standard grip scales removed the skeletonized handle design reveals cutouts that allow the user to wrap the handle with paracord to achieve a custom contoured grip. Now the user has a length of cordage that can be used for shelter building, snares, and traps, and to turn the knife into a spear. The pommel of the Skeletek Dagger is rugged enough to be used as a pry tool. However, it is contoured sufficiently to be used as a thumb rest in a reverse grip. Alternatively, it may also serve as a heel rest when using the knife in a forward grip. The grip scales are thick and give the dagger its heft, yet thin enough to allow for proper indexing of the knife edge. I am really enjoying my new Skeletek Dagger from Slysteel. As this is a now a new addition to my every day carry. 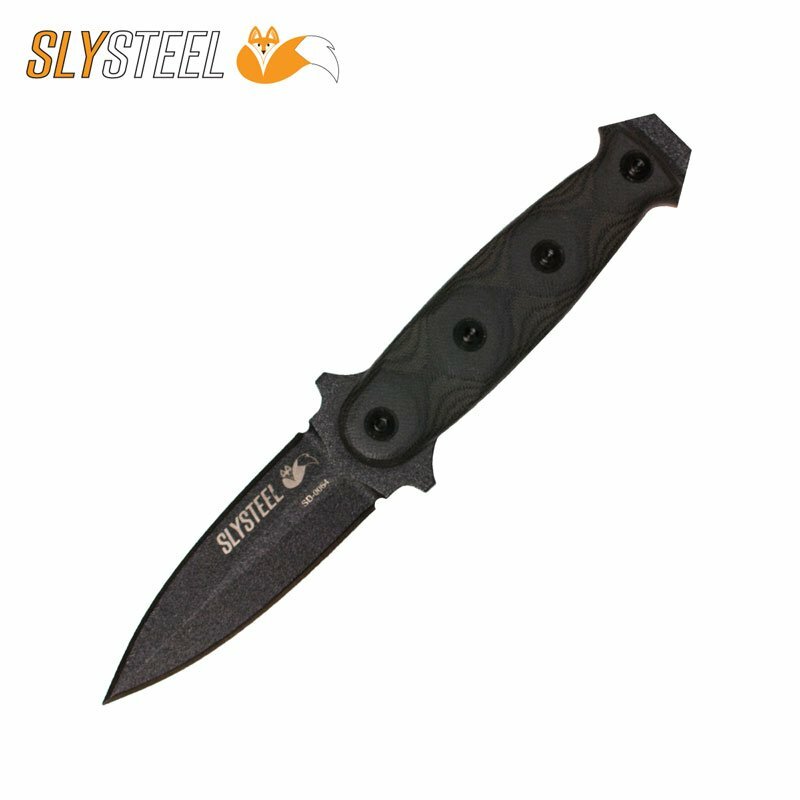 I really think that it is great that this knife is made by a U.S. company. 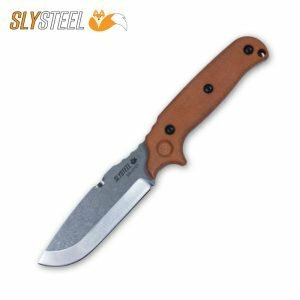 You can definitely tell that this knife is high quality and made with great precision. This is one reason why I always try to buy American if at all possible. I like that the Skeletek Dagger’s primary purpose is for self-defense, but if needed it can perform multiple tasks with it’s double edged blade. The Skeletek Dagger features a laddered skeletonized handle for which you can use with scales, without scales, or even wrap with paracord. I noticed that the Dagger fits the kydex sheath perfectly in any of these handle configurations. When you insert the knife into the sheath, it locks right in with rock solid retention. It does not feel loose or wiggle in the sheath in any way. 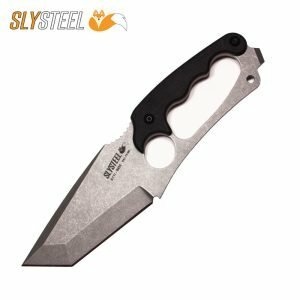 The feel of this knife in the hand just screams high quality, durability and is very ergonomic. Once you have this knife in your hand, you can definitely tell that this is a no nonsense knife! 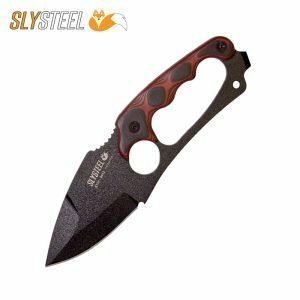 I would definitely recommend this knife in a heartbeat to any of my friends or family that are looking for high quality knife. Great job with this knife design SlySteel, I am really enjoying it! In addition to the stunning looks, this dagger feels natural and extremely comfortable in hand. When deploying and reversing the grip its balance makes it very nimble and swift, but not at the expense of feeling thin or delicate. The blade thickness is just right and the point feels like it could punch into a tank hull. 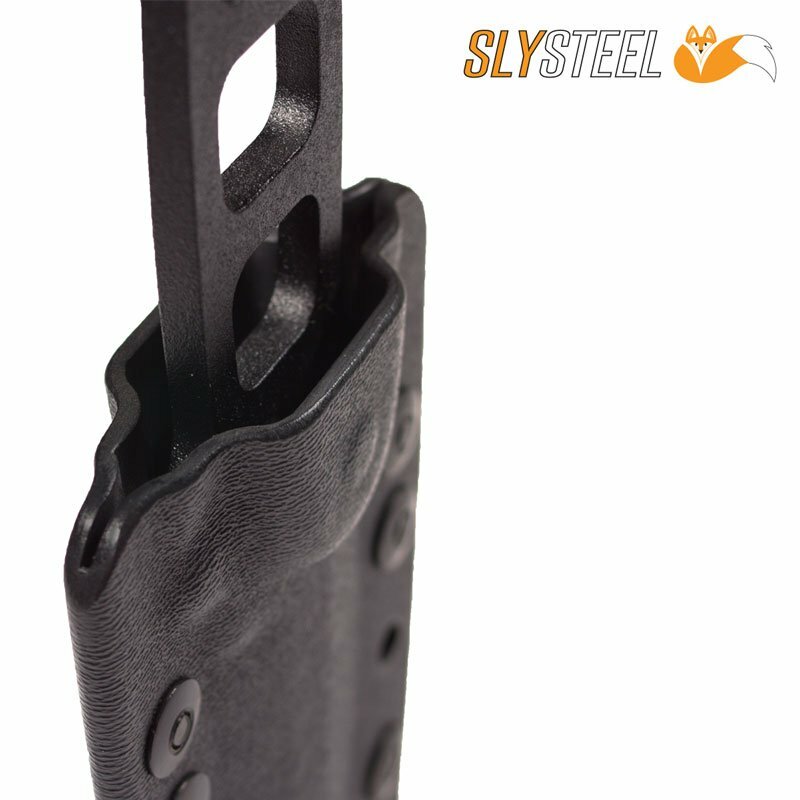 The sheath is well-made and extremely flexible for carry options and mounting hardware. This dagger’s design is a perfect example of the form, and its quality, fit and finish are all first rate. This is a beautiful knife and great edc tactical knife! Love the form, handle, sharpness, balance and weight of this knife! I would bet my life on this knife! Skeletek Dagger has a great feel in the hand and superior heat treating. But where it really shines is in the sheath. The pancake style sheath leaves the options for carry wide open. 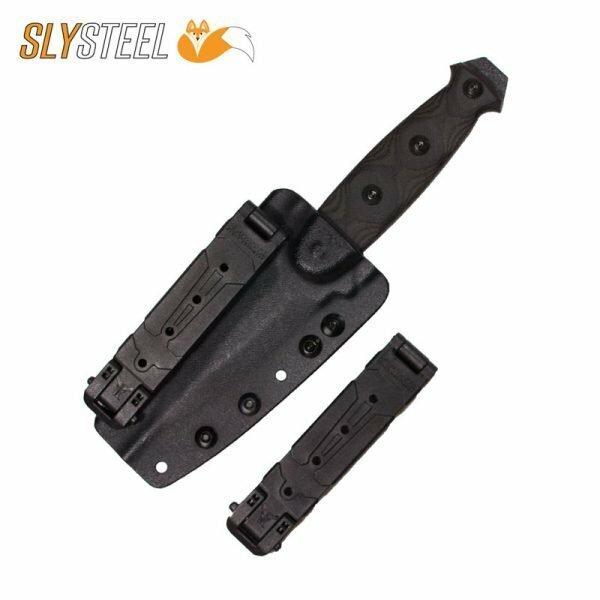 When you remove the handle scales and get down to the skeletonized grip, it is super slim and perfect for boot or IWB carry. The Skeletek was designed to go where you go, but not be seen, and it does that perfectly and comfortably.